I read this article and found it very interesting, thought it might be something for you. The article is called Improving Slowly, India Ranks 145 Among 195 Countries on Healthcare Access and Quality and is located at https://archive.indiaspend.com/cover-story/improving-slowly-india-ranks-145-among-195-countries-on-healthcare-access-and-quality-83144. 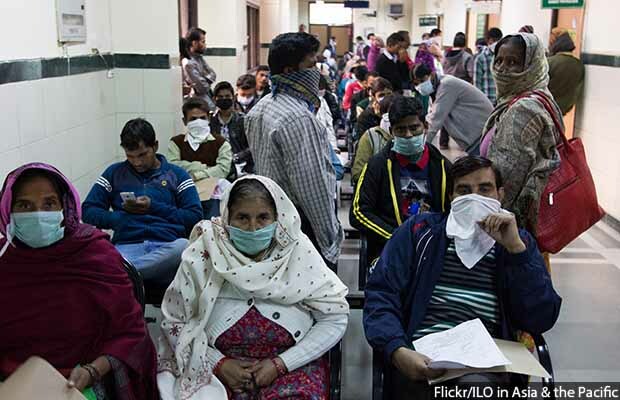 New Delhi: India has improved its ranking on a global healthcare access and quality (HAQ) index from 153 in 1990 to 145 in 2016, yet ranks lower than neighbouring Bangladesh and even sub-Saharan Sudan and Equatorial Guinea. In 2016, India scored 41.2 points on the healthcare access and quality (HAQ) index created by the Global Burden of Disease study published in the medical journal The Lancet on May 23, 2018. This 16.5-point improvement in 26 years leaves India’s score well below the global average of 54.4. Despite improvements in healthcare access and quality, India lags way behind its BRICS peers Brazil, Russia, China and South Africa on the HAQ index, but matches China in disparity in healthcare access and quality between states. The index is based on 32 causes of death considered preventable with effective medical care. It assigns a 0-100 score to each of the 195 countries and territories assessed. For the first time, this year’s study analysed healthcare access and quality between regions within seven countries: Brazil, China, England, India, Japan, Mexico and the USA. India ranks worse than Bangladesh, Sri Lanka and Bhutan among its neighbours but better than Pakistan, Afghanistan and Nepal. In South Asia, Bangladesh made the most improvement, of 29 points, improving its ranking from 180 in 1990 to 132 in 2016. In contrast, the rankings of Afghanistan and Pakistan worsened from 187 to 191 and 145 to 154, respectively. India’s rank is also worse than that of many poorer countries in Sub-Saharan Africa such as Sudan (136), Equatorial Guinea (129), Botswana (122) and Namibia (137). Even conflict-ridden Yemen (140) performs better than India. As pointed out before, India lags behind its fellow BRICS countries Brazil, Russia, China and South Africa. However, China has made an improvement of more than 35 points in 26 years, going from the 108th rank in 1990 to the 48th in 2016. In contrast, the rankings of Russia and South Africa worsened from 45 to 58 and 114 to 127, respectively. In 2016, Goa with 64.8 points replaced Kerala with 63.9 at the top of the HAQ index within India. While Goa improved by 26.8 points, Kerala improved by 20.8 points over 26 years. Other top performers in order of rank are Delhi (56.2), Himachal Pradesh (51.7) and the union territories other than Delhi (56.2). The worst performers were Chhattisgarh and Jharkhand (34.7), Bihar (37), Odisha (36.3), Uttar Pradesh (34.9) and Assam (34). These regional differences in India and China could be due to multiple reasons such as large variations in physical access to health facilities, the state of health infrastructure, the level and scale-up of medical technologies, and the provision of effective services across the spectrum of care, the study said. High- to middle-income countries recorded higher scores and made greater gains in countering non-communicable diseases, the study found. Most other countries also made improvement in key health areas, most notably vaccine-preventable diseases. Generally, countries that spent more on health per capita and had better health systems scored higher on the HAQ index, the study found. This strengthens the case for India to increase its healthcare spending. India spends just 1.4% of gross domestic product (GDP) on health, as IndiaSpend reported on January 30, 2018, creating a healthcare crisis that is holding back the country’s potential. The World Health Organization recommends that countries spend 4-5% of their GDP on health to achieve universal healthcare. At the same time, the Global Burden of Disease study noted, in case of low- to middle-income countries, greater spending alone may not result in better access and quality. For example, some countries with a HAQ index of 40 to 70 points spend more than three times their peers. It is the presence of greater numbers of doctors, nurses and midwives per 1,000 population that leads to better performance on the HAQ index, the study said. In 2016, the global average healthcare access and quality score was 54.4, up from 42.4 points in 2000. Disparities between countries remained similar in 2016 and 2000, with a 78.5 point gap between the best and worst performers in 2016–the worst being Central African Republic with 18.6 points and the best, Iceland with 97.1. Comparable figures in 2000 had been 79.3 points’ difference between Somalia (13.5) and Iceland (92.8). Some countries’ progress slowed or even stalled over this period, which, the authors of the study said in a press statement, could be a warning sign that their health systems are not evolving at the same pace as the needs of their populations, at a time when many non-communicable diseases and cancers are becoming more common. “These results emphasise the urgent need to improve both access to and quality of healthcare, otherwise health systems could face widening gaps between the health services they provide and the disease burden in their population,” Rafael Lozano from the Institute of Health Metrics and Evaluation at the University of Washington, USA, and senior author of the study, said in the statement.